What is Medical Malpractice in Florida? Medical providers in Florida are held to what is known as a “reasonable standard of care," meaning what any reasonably careful doctor, surgeon or health care provider would have done in treating a similar patient under similar circumstances. This level of care is sometimes referred to as a “minimum standard of care.” The reasonable or minimum standard of care is generally established by having a qualified expert review the patient’s medical records and give his or her opinion whether the reasonable or minimum level of care had been given to the patient. How Does A Medical Malpractice Attorney Help Your Claim? When an experienced medical malpractice lawyer is investigating a case, they will first request a copy of the patient’s complete medical records. The lawyer then looks for an expert (doctor, surgeon or other provider) who is willing to review the record and give an opinion as to whether the reasonable or minimum level of care had been provided to the patient. The expert would need to find the doctor, surgeon or provider was negligent in the care they gave. This is only the first step. There must also be a finding that the doctor, surgeon or provider’s care resulted in injury to the patient. There must have been a connection between the medical mistake, or breach of the reasonable standard of care, and the injury or harmful result the patient is suffering. A malpractice case in Florida requires the injured person to have evidence of negligence and, what is often referred to as, causation resulting in the injury to the patient. There is difference between medical negligence (malpractice) and a bad outcome or result from the medical treatment. Medical literature has documented that, even with perfectly performed treatment or surgery, a small number of patients may suffer a bad outcome. Having an unexpected, unfortunate or even tragic outcome does not necessarily mean it was caused by medical malpractice. In the medical-legal world, these unexpected results not caused by medical malpractice are known as “known complications” of the given treatment or procedure. The question is whether the patient’s injury was caused by a medical mistake or was an unfortunate, known complication. Medical malpractice cases are possible based on care by many types of healthcare providers, including doctors, surgeons, nurses, physical therapists, anesthetists, pharmacists and many others. 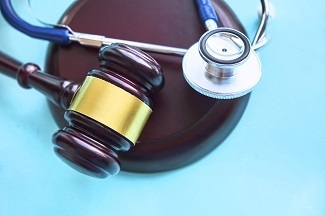 In evaluating whether a specific type of healthcare provider met the reasonable standard of care for their area of practice, lawyers will typically seek the opinion of an expert who is a similar provider or specialist. To learn more please contact us online or call our office directly at 888.815.6398.